During the last 15 years, the interest in vehicular communication has grown, especially in the automotive industry. Due to the envisioned mass market, projects focusing on Car-to-X communication experience high public visibility. 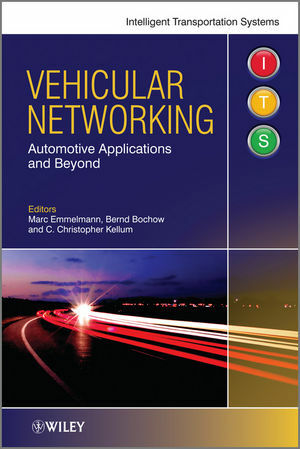 This book presents vehicular communication in a broader perspective that includes more than just its application to the automotive industry. It provides, researchers, engineers, decision makers and graduate students in wireless communications with an introduction to vehicular communication focussing on car-to-x and train-based systems. Emphasizes important perspectives of vehicular communication including market area, application areas, and standardization issues as well as selected topics featuring aspects of developing, prototyping, and testing vehicular communication systems. Supports the reader in understanding common characteristics and differences between the various application areas of vehicular communication. Offers both an overview of the application area and an in-depth discussion of key technologies in these areas. Written by a wide range of experts in the field. As a member of the Telecommunication and Networks Group (TKN), his current research focuses on wireless networks with special interest on supporting mobility for high-velocity vehicles. Special interest has evolved in MAC-layer supported seamless handover with QoS guarantees. He has written numerous journal articles and has contributed to a book chapter. Mr Bochow has been contributing to numerous national and joint European research and development projects (ITEA, EURESCOM, ACTS, IST) as well as performing contractual work for national customers both as a researcher and as a project manager. His recent research interests are in the area of vehicular ad-hoc networking and cognitive radio. He is also participating in the standardization of car-2-car communication systems. He has written several journal articles and contributed to a book chapter. Mr Kellum worked five years at General Motors Research & Development in Warren, Michigan during which time he developed collision warning and avoidance applications using enhanced digital map data and vehicle-to-vehicle communication. Additionally, he has contributed to the Society of Automotive Engineers DSRC Data Dictionary standards. Since 2006, he has worked in Europe on vehicle-to-vehicle communication and the Car2Car Consortium as well as object detection sensors for active safety. He has written a number of journal articles.